“Organic tea production is superior for the land, excellent for the grower and processor, and good for the consumer.” The Story of Tea: A Cultural History and Drinking Guide by Mary Lou and Robert Heiss. 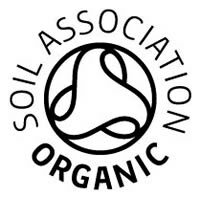 The Bristol Tea Company is committed to offering organic teas and all our teas except our Kanoka Assam* have been certified by the Soil Association, the UK’s largest organic certifying body. The benefit of certifying our teas organic means that our customers can be assured that they are purchasing a fully traceable product that has been grown to the highest environmental standards. We hope that gaining certification for our teas, in a small way, promotes organic principles; highlighting and celebrating these tea estates for their dedication to growing a really fantastic product using excellent environmental and sustainable farming practices. Importing and marketing organic tea means we have to comply with a number of regulations to meet the approval of the Soil Association, Defra and the Port Health Authority, who control the arrival of goods into UK ports. Tea estates in India, Sri Lanka and elsewhere must meet equivalent standards to gain certification through corresponding bodies. The Bristol Tea Company is inspected once a year. Organic farming seeks to work with the natural world, encouraging and fostering a crucial biodiversity, whilst building up healthy, fertile soil through the application of organic manures, composts and mulches and away from the use of synthetic pesticides and damaging chemicals. 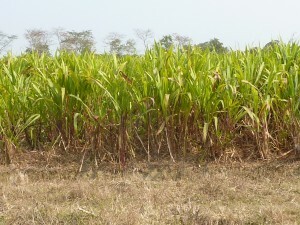 For example, Guatemala grass (pictured) is used as an effective mulch to improve soil, supress weeds and help retain soil moisture during dry periods. 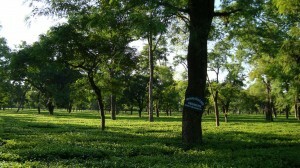 In Darjeeling, where some of the finest teas are produced, more and more estates are converting to organic practices. The agricultural use of hazardous chemical fertilisers and pesticides can contribute to the pollution of water sources, a dangerous working environment and the degradation of soil and land erosion. I believe I witnessed on a conventional, non-organic, estate in Assam spraying being undertaken where workers wore no protective clothing or facemasks. Indeed the BBC in a report ‘The bitter story behind the UK’s national drink’ by Justin Rowlatt in 2015 filmed this happening on more than one estate. 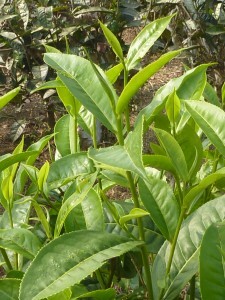 Whilst there are strict regulations relating to the kinds of chemical fertilisers and pesticides allowed on non-organic teas grown for import into the European Union, and any company wishing to trade with Europe needs to comply with these standards, certain EU banned chemicals remain in usage throughout India, China and other tea growing regions. Greenpeace tested popular teas from well established companies in India and China in 2014 and state they discovered not only evidence of high levels of pesticide use but traces of banned chemicals including DDT. I have spoken with one manager who has worked on both conventional and organic estates. He described how early on his career, at a conventional estate, the company would spray once a year but as pests and diseases became more resistant to the chemicals spraying became more and more frequent, furthering the depletion of the soil. The conversion to organic tends to see a considerable drop in the expectant high yields. And whilst yields may improve over the years they are unlikely to reach earlier levels. However in Darjeeling, with the reputation and ability to demand high premiums, more estates continue to convert. Sadly in Assam, which is the largest tea growing region in the world, organic cultivation remains relatively unusual; especially at a time when organic farming, in general, throughout India is going from strength to strength. More positively, however, alongside the several large estates there are plenty of small farms pioneering organic standards; such as the Kanoka Estate where we get a beautiful handcrafted tea. The Organic Small Tea Growers Association of North East India was formed to bring together farmers to share experiences, learn best practice and also promote a growing interest in specialised handcrafted organic green and black Assam teas. I saw during my visit in 2015 a definite interest in the health benefits of green teas. Most small tea growers currently sell their raw leaves to large estates, however OSTGA is working to create a market whereby the farmers can sell direct to the consumer or into the International market; allowing them a better price and livelihood. The Bristol Tea Company hopes that our organic certification shows that we care about provenance, sourcing a fully traceable product, from estates dedicated to growing and manufacturing the finest teas with a commitment to excellent agricultural and environmental practices. We believe that these practices are best for the natural environment, better for those working and living in the estates and great for us consumers. * Our Kanoka Assam is from a family run estate near Tejpur in central Assam. 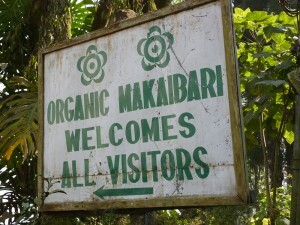 They have just 8 acres of tea bushes within a mixed crop farm. 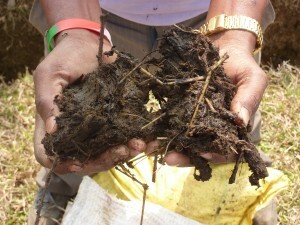 They farm using organic practices and are certified in India. We import just small quantities direct from Kanoka and it is currently not practical, or economically viable, to pursue organic certification.